Studies have shown that dogs not only provide an optimal social support network for humans, but also that positive interactions with dogs increases the endogenous levels of Oxytocin and other anti-stress agents in the human brain. As an alternative to other unnatural drug related treatments, the focus, nurturing, and social attention towards service dogs has shown to naturally increase the levels of Oxytocin in humans. 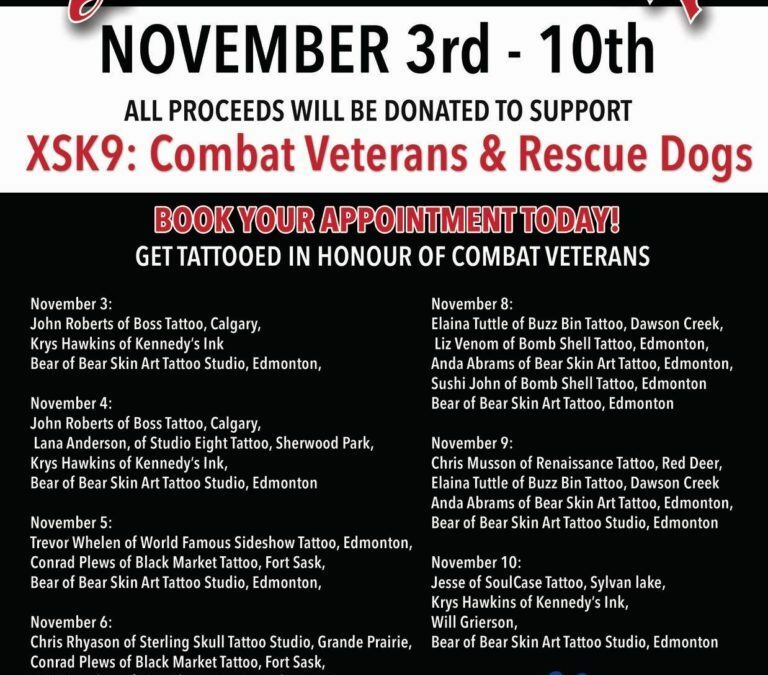 All XSK9’s service dogs are all local rescue animals, that have been provided with expert training. These animals are not pets, they are trained service dogs, that provide a service to the brave men and women who have suffered for our country. Each dog has completed a training program delivered by a school or institution accredited by Assistance Dogs International, Inc, in order to comply with Alberta, Laws and regulations for Service animals. After our dogs have been expertly trained they meet with veterans in need of their service. Veterans find the dog that best matches their individual personalities and needs. XSK9 believes that the growth learning and development process is best coupled between dog and veteran. Our organization helps facilitate this training so that the dog’s transition into your life is seamless. Giving veterans a true companion that can provide to them the safety, comfort and security that they have provided to our nation is truly, the most rewarding experience. Every dog adopted out goes to a great caring and nurturing home and every veteran is given a second chance at living a peaceful civilian life. Our organization is completely grant and donation funded, we do not believe in charging veterans for dog’s. The price that they have paid to protect our country is far more then we could ever ask in return. In order to keep this organization running we require YOUR help. Donations, supplies and volunteer time are always welcome. We truly appreciate all of our supporters and we know that any amount or type of support that you can give will go a long way to allowing us to keep our organization running. Everything we receive goes directly towards helping match veterans with dogs to better their life and allow them to live the rich lives they so much deserve. Please help us given veterans the hope for a new life that they so bravely fought for.